European Waterways is adding to the appeal of its luxury hotel barge cruises by offering up to 20% off charter and cabin prices for selected Spring and Summer departures across Europe. Some of these cruises also include a complimentary stay at an iconic Paris hotel, with private chauffeured transfers to and from the vessel. These specials reflect the company’s increased focus on attracting travellers who are looking for more intimate, experiential opportunities as they cruise the scenic countryside – all while enjoying first-class service and amenities aboard some of the finest hotel barges in the industry. These special offer prices are based on double occupancy and bookings must be made by May 14, 2018 to be eligible. 20% off whole-boat charter prices, applying to departures April 29 and May 13; and 10% off charter prices on the July 15 and August 5 departures. Charters include a free night’s stay at a Paris hotel and return transfers in top-of-the-line Mercedes-Benz minivans. La Belle Epoque also offers 20% off per cabin on its June 17 departure; and 10% off per cabin on departures April 22, May 6, July 1, July 29, and August 12 departures. 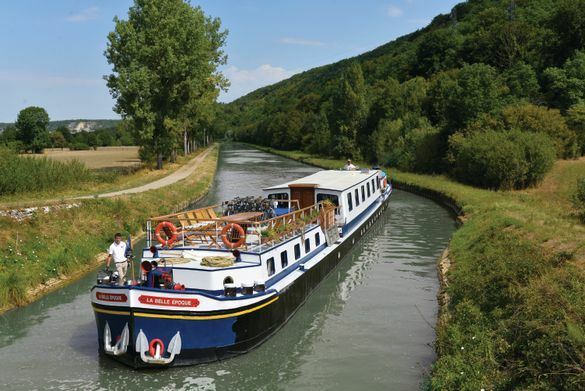 With one of the company’s most diverse itineraries that includes Holland, Belgium, and France, Panache offers 20% off whole-boat charter prices on its June 3 Picardy-to-Paris cruise and its June 17 cruise in France’s Champagne region, as well as 10% off charters on its August 26 cruise in Alsace & Lorraine. In addition, cabin prices are available at 20% off on its May 6 cruise in Holland; May 20 cruise from Holland to Belgium; and May 27 cruise from Belgium to Picardy; with 10% off on its July 29 cruise in Alsace & Lorraine. In the demonstration galley, guests can watch the on-board master chef prepare gourmet meals, sourced from local ingredients. Finesse offers 20% off whole boat charter prices and a free night at a Dijon hotel for departures on April 22, May 6, June 3 and 10, as well as July 1, 8 and 15. 20% off cabin prices also applies on its April 15 and 29, May 13, and May 20 departures. Sample cruise/price with offer applying: La Belle Epoque Burgundy departure on June 17, 2018 – £3,160 per person. European Waterways’ 6-night cruises, based on double occupancy, include all gourmet meals, fine wines, open bar, daily escorted excursions, admissions and private chauffeured transfers. Hotel Barging is a boutique, unique experience which offers an immersive, all inclusive “gentle voyage of discovery” that focuses upon the culture, history, fine wine and gourmet cuisine of the region. With a 6 to 20 person capacity and 1:2 crew to guest ratio, European Waterways is able to provide an impeccable level of on board service and can transport their guests on the intimate inland waterways that are inaccessible to larger vessels. This fascinating network of smaller canals allows for flexibility, spontaneity and ample opportunity to hop off and explore the beautiful surroundings via bicycle or on foot. In addition to this there are daily chauffeured excursions “off the beaten track” to a wide variety of enthralling locations, from exquisite wine tastings to private tours of stately homes. With over 40 years’ experience and a fleet that spans nine countries it is the largest luxury hotel barging company in Europe.